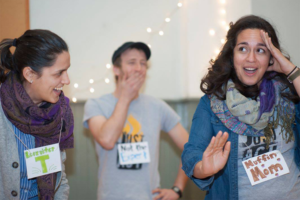 Local Organizer with Carnival De Resistance, an Ensemble Member with Just Act, and a current artist in residence with the Painted Bride Art Center’s BrideNext project. Her work has been performed at FringeArts, the Outlet Dance Project, Performance Garage, Inhale Performance Series, and Koresh Artist Showcase. Belle was a featured artist in Birds on a Wire Dance Theatre’s HATCH Series. An active arts educator honored with a scholarship from the Bartol Foundation, Belle educates children K-12 as a Teaching Artist with award-winning Pierre Dulaine’s Dancing Classrooms, Yes! And… Collaborative Arts, Koresh Dance Company, and Friends Central School.